SSC CGL Tier 1 Result 2016 ssc.nic.in: The Staff Selection Commission is going to announce the result of Combined Graduate Level examination. It will release the same on its official website www.ssc.nic.in on November 8, Wednesday. On October 14, it released a notification stating the result declaration date. In addition to it, the same notification said that the SSC CGL 2016 exam was conducted in more than 465 test centers spread over 96 cities across the nation. The exams took place from August 27 to September 11 this year only. A total of about 38 lakh aspirants registered for it, but only 15 lakh candidates appeared. The CGL Tier 2 is slated to take place from November 30 t0 December 2. SSC, every year, releases the recruitment notification to recruit the eligible candidates to the various vacancies which come up each year. It is responsible for conducting and selecting the working staff in various government departments. The Commission will soon release the confirmed examination schedule for the second leg of the recruitment drive. 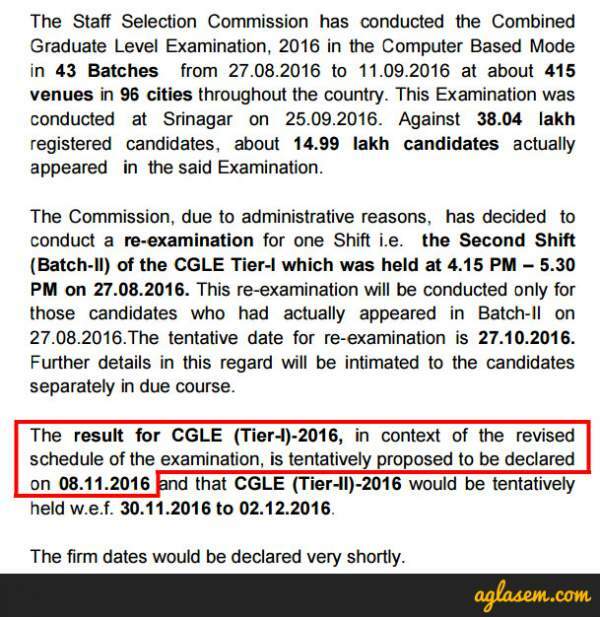 Another notice by the Commission’s chairman himself states that the tentative dates for the SSC CGL 2016 final result is going to be around April 2017 end. Also: RRB NTPC 2016 Result. Follow the below-mentioned steps to easily check the SSC CGL Tier 1 Result 2016 online. Look for the link stating the result of the CGL Tier 1 exam 2016 under the Latest News section on the homepage itself. Click on it, and the next page will ask for your personal details like registration number, etc. The next window will carry your results. Take a print our for your future reference. In the case of any query, feel free to ask via commenting below. TheReporterTimes team wishes all the candidates all the very best. Don’t forget to share your result with us below. Hope for the best and have a bright future ahead. What did you score? Stay tuned to The Reporter Times for latest SSC news and other exam updates across the country. When announces cgl results 2016???? Kab aayga. Result .I am tired….